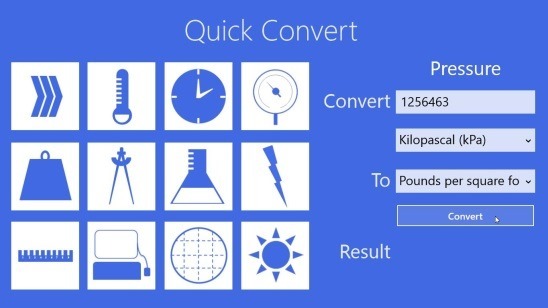 Quick Convert is a free unit converter app for Windows 8 that lets you easily convert units of measurement. It can convert units under twelve different categories, including Velocity(speed), Temperature, Time, Pressure, Mass, Angle, Volume, Energy/Work, Length, Data, Area, and Power. The app is pretty powerful as there are multiple metrics under each unit, for example, Volume has metrics like liters, milliliters, imperial gal, cubic inches, etc., Data has KB,MB,GB,TB, and PB as its metrics, and so does the other units. This unit converter lets you quickly convert the units in few mouse clicks, and the app is quite useful to students as it basically contains almost every units of measurement which is taught in schools. But at the same time, it is equally useful to adults as well, as there are multiple instances in our day to day life where we need to convert the units from one metric to another. This free unit converter app is available under The Tools Category in Windows Store. The app’s interface is simple and well designed, it has got just one single screen, so there’s no navigation needed. The fact that everything which is required for unit conversion is on one single screen makes the app a quick medium for unit conversion. You don’t have to navigate between multiple screens just to convert metrics of different types such as volume, speed, temperature, energy, etc. Simply click on the desired unit of measurement, enter the requisite value that you want to convert, select its metric, and then select the desired conversion metric in which you want the entered value to get converted. Finally click on Convert button. It’s as easy as that. As mentioned earlier that the app supports a total of twelve different units of measurement. Plus, each unit of measurement consist of multiple different types of metrics. So this makes the app more powerful as you are getting a big range of options to choose from, for converting units. Follows a screenshot of the unit converter app showing the step to convert pressure metrics. When people think of a Unit Converter, they usually think of a boring, mechanical image of the app, but this unit converter goes one step further, as the graphics/icons of units on the app are good in design. Everything is at right place and looks good. Free unit converter app for Windows 8. Supports total of twelve different types of units of measurement. Each Unit of measurement has multiple metrics. Simple, easy to use, and quick. 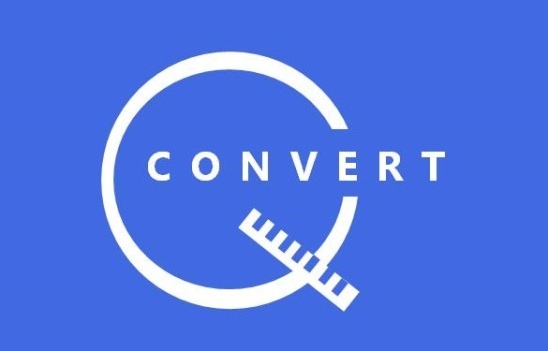 Quick Convert is a pretty handy unit converter app as it brings almost all useful units of measurement in one place for conversion. Though a very important unit is still missing which is Currency (which might get added in later versions). Still it’s good to have this app installed in your PC, as it’s all for free.